This all began when I was collaborating with people in the Northeast getting battered with nor’easter snow, people I was working with in Moscow were getting snow, and friends in London (a city which rarely gets snow) were dealing with heavy snow. A lack of sunlight can cause seasonal affective disorder, and it can alter your mood. I was actually going through a pretty rough week, and the weather forecast for the next few days was rain. I decided to go to the beach on a whim in the hopes I could bring my mood up. I’m happy to report, as I write this, that it greatly boosted my mood and productivity. I’ve always wanted to “code on the beach,” but I was living in cities like London where the dream just wasn’t realistic. I live in California now, and I want to explain some basics for those of you that also want to work from the beach or anywhere else. Feel free to tweak to personalize to your needs; I’m only providing very general guidelines. Working from home was for the 1990s. We now have the technology that you can essentially #WorkFromAnywhere. From LTE/mobile hotspots to cloud computing, we should broaden our dreams and experiences because we have the tech to do it now. The beach isn’t a coffee shop. You might not find any power outlets. 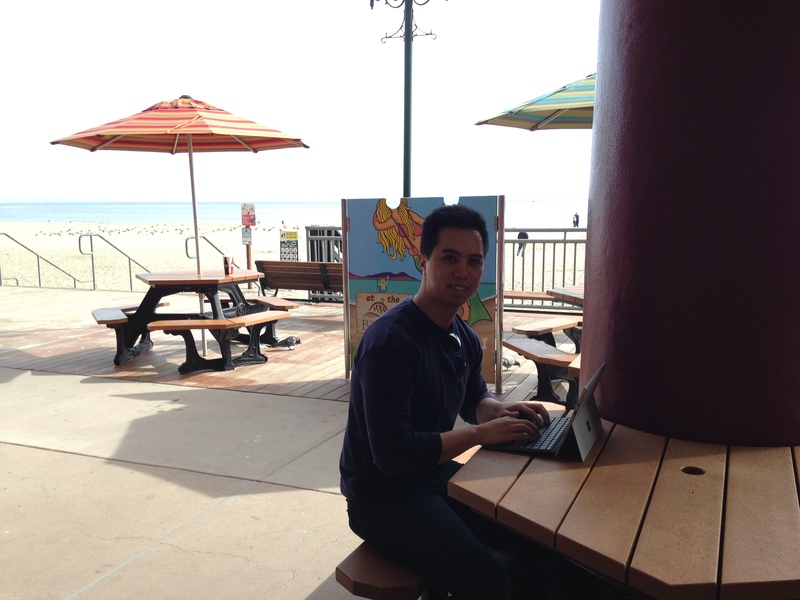 The first secret to working at the beach is to get a laptop with long battery life. I use the Microsoft Surface Pro 4 Core m3. The Core m3 actually benchmarks favorably against “desktop replacement” laptop CPUs from the Sandy Bridge era (e.g. Core i5-2450m). Don’t bother with the Core i5 or i7 Surface models. Some of you might think you need a “heavy-duty” laptop for programming. I’ve got a Lenovo Ideapad 310 with the Core i7-7500U (Passmark: 5216), 20gb DDR4 RAM (upgraded), 256gb Samsung 850 Pro SATA III SSD (upgraded), and Debian Linux 9.3. Building a C++ program with ~2000 lines of code (g++) takes 1% of battery life from the Lenovo. Meanwhile, I rarely charge the Surface Pro 4. I don’t bring the cord with me. It usually lasts me an entire day. If you’re really desperate though, you can get a car charger for the Surface Pro 4 on Amazon. When you can go fully cordless, it gives you a sense of freedom, and you’ll have the confidence to live and work from anywhere. You can get quite creative with the setups here. The goal is to optimize battery life and mobility (mainly, being able to carry your work anywhere and have all the data in one central location). I don’t worry about something going wrong with my laptops. All my work gets backed up to the cloud in some way. There are lots of ways to do this. For Linux (and I guess Mac too), I use sshfs. This allows me to effectively “carry my workstation” anywhere. I’ve got a tower with space for 10 HDDs/SSDs. I don’t need to carry all that data around, I don’t need to wait for syncing across multiple devices, and I don’t need to configure backup for the data on every device. I can just mount via sshfs, and I can access my entire workstation and all of the files – securely (with encryption) over SSH – via sshfs. I also don’t worry about public WiFi because I have encryption. Warning: sshfs can be pretty slow so some unencrypted alternatives you may consider might be FTP or NFS. OneDrive integration is tighter on Windows. I don’t need to create a private git repo (you don’t need a paid GitHub plan for this anymore; see GitLab) for every experiment I need backed up. I can work locally from my editor of choice, and each time I save from my editor of choice, it’ll automatically sync with Microsoft OneDrive. If you really need a “heavy-duty” computer, configure a server. Login via SSH. Run your compiles on the server. Don’t kill your battery life. My secret spot is the Santa Cruz Boardwalk. They have WiFi there. Yes, really. I work from the beach, and I have decent WiFi. As a last resort, you can create a mobile WiFi hotspot using your phone. (e.g. For the iPhone, it’s in Settings -> Personal Hotspot.) However, this drains your phone’s battery life. Make sure you still have enough phone battery to GPS your way back home! The last step is to just enjoy. The best part about working at the beach is that, when you need a short breather, you’re not staring out an office window. Take in the fresh air, check out the beach restaurants, enjoy the sand. I’m honestly convinced that the weather and getaway will do wonders for your mood and productivity. I’m beaming with joy as I write this, and it beats any office with the best city views, the same StarBucks coffee shop layout, or the same neighborhood views you see everyday from a home office.